CrossOver ported the open-source Chromium browser over to Mac and Linux using Wine. Bear in mind that this is more of a proof-of-concept and not the official version, but you can still download the binaries and play with it. 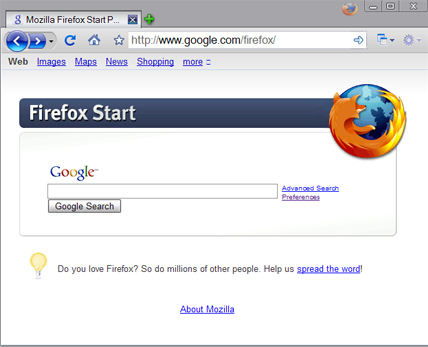 If you like the look and feel of Chrome but can’t leave your Firefox 3 extensions behind, someone made a Chrome lookalike extension so that Firefox looks like Chrome. Lots of different places, including ChromeSpot, talk about how to do other themes, from “Galaxy” to the Boston Red Sox. As you might imagine, all of this stuff might break in various weird and wild ways, but that’s part of the fun of tinkering. If you want to play it safer, you can read great Chrome tips from Lifehacker, Google OS, or Google Blogoscoped. And since you’ve read all the way to the bottom, let me mention a tip that I haven’t seen widely mentioned. In Chrome, Control-V will paste from your clipboard and preserve formatting. If you use Control-Shift-V, only the text will be pasted. This can be handy for some programs such as Google Docs that let you paste rich objects like images and formatting–but sometimes you want to paste only the text. The Firefox extension is a nice tip for those of us waiting for Chrome on the Mac – Thanks! Very nice, Matt. Will come handy in many ways, especially when posting quotes or excerpts on a blog. Well, I LOVED Chrome when I first started it. When first couple of pages loaded, I tought I went from dial-up to DSL line once again. 🙂 But, the thing is, it freezes whole often a lot – especially ‘cos of Flash or PDF files. It was told it should work in other tabs/instances if one freezes, but that’s not what happens in reallity. 🙁 I hope it will get more stable after time. So how much longer do us Mac users have to wait? Chrome is using the same rendering engine as safari so let’s get your guys to slap on some wheels and a cheap paint job and give us something better than this. Safari locked up on me twice today and it’s irritating as hell to have to quit the whole thing because one tab locks up the whole browser. As soon as Chrome comes to the mac I’m dumping Safari and using it instead. I’ll keep Firefox because what self respecting web designer would get anything done without Firebug? When are Google going to fix the major security hole that Steve Gibson mentioned in security now last week ? Hey matt the Sphin link you posted is good, Google toolbar and SeoQuake functions for Chrome. Doesnt Google want SEO peoples doing this? I’m really looking forward to the extensions arriving for Chrome but it makes me feel disloyal to Firefox – I feel like a browser turncoat! Thanks for the the Control+Shift+V paste text only feature tip. FYI – If you want to be able to plain text paste into all of your Windows apps, there is a cool app called PlainTextClipboard (free & nothing to do with me) that lets you “plaintextify” your clipboard at a keystroke. I just downloaded the new version of this browser, but couldn’t do much with it due to non-availability of File menu on the top . Can you guide me..? 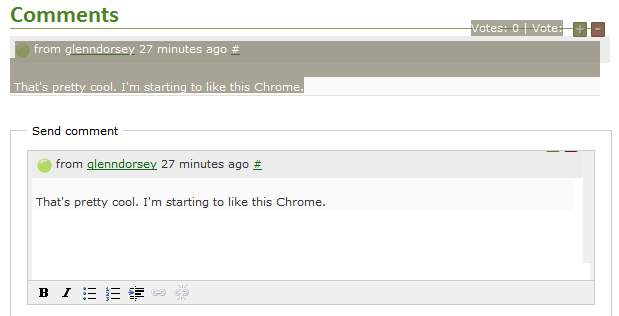 I’m lovin’ chrome at the moment. Only thing that i miss is the refresh right click menu option. Not sure I’ll go as far as modding it though. As soon as I can get a roboform plugin, I’ll make the permanent change. The speed compared to FF or IE is enough to make anyone that spends 12 hours a day switch over. I love paste without formatting. I can’t tell you how many times I’ve opened notepad just to paste formatted text, lose the formatting, and copy it again. Ctrl + Shift + V should be a universal shortcut. Maurice, do you know which security issue Steve Gibson was talking about? I know that the recent Chrome update already fixed a couple issues. ThomasO, I thought that was a fun Sphinn story to use as an example. It’s amazing what bookmarklets can do. Thanks for the heads up Matt!! I’ll have to try that out. I am really enjoying Google Chrome so far and really look forward to future updates and add-on’s/plug-ins. It does have some issues that need worked out but that is to be expected! In my opinion Google & the Team did a wonderful job – It’s FAST, Clean and FREE! Great Job > Google Chrome Team!!! I like Chrome mainly cause it gives me a lot more screen space, without all the extra toolbars and status bars and whatnot (probably partly my own fault for tricking out my IE and FF the way I have) But I cannot figure out why I can’t see a lot of CNN stories in it – it’s like the blog portion just doesn’t show up; all the navigation and whatnot is there. Really weird. I just absolutely adore Chrome it’s brilliant..Smart and there was me thinking Firefox was going to be the Google Browser…. Hey Matt, quick question regarding Google Docs. You bringing it up made me think of something. Whats up with Google Docs not being able to search for entries in an entire spreadsheet but only sections of the document? I have spreadsheets that go into the 1000s (not that many entries) but stuff I just enter and know is there will not return any results if you search from the top of the doc. Wonder what kind of tool do you use to capture all those screenshots? Is there some kind of Firefox extension, and does it work in Chrome? I have been using Chrome quite a bit (it’s now my main browser at work) and it is fantastic, once you get used to it. At any rate, Spin is full to the brim with HIGH risk, ignorant and vested self-interest posts and a haven for ANY blackhat Danny S can become bum chums with (99.9%). I refuse to read there. Please revisit bacon polenta, when you get a chance. it was the recovering saved passwords clear text problem which would stop a lot of big corporates alowing its use. Thanks for filling in the details. Good tip on the Ctrl-Shift-V.
Why do you think this interests me? Besides, I read Google Official blog daily. Can we install google toolbar in Chrome? 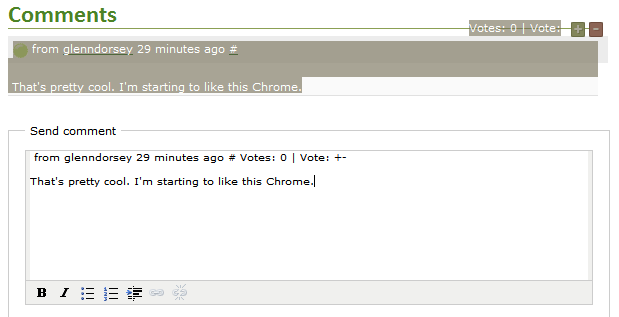 Deb, Google Chrome doesn’t support any extensions right now, so no Google Toolbar either. Lots of the useful functionality of the Google Toolbar is accessible via Chrome though..
A small little question for you. Is Google Chrome going to come up with a toolbar or we will have to wait for that. Please let me know as i found Google Chrome to be a very useful one and i was wondering are there any hidden benefits for Webmasters who can immediately get the status of the website which they are managing. Please do not ignore my comment. Wow this Chrome is the best thing since sliced bread and it don’t even have any mods! Can;t wait for the web developers ad ons! any comment on that Matt? as to a eta or if their is even a add on for developers on the way ? ← Best Yogurt in Silicon Valley?